Consulting and coaching for leaders and groups who intend to thrive in a world of challenging economic, social and environmental realities. We support executives and senior teams in businesses, non-profit organizations, education and government to enhance their influence and achieve success in leadership. We also work with emerging leaders. Our clients tell us that we help them see new and broader perspectives that allow them to address real and underlying issues that block their success. Our focus areas include corporate responsibility and sustainability leadership, change leadership, adaptive leadership and executive coaching. Are you frustrated with taking your organization’s environmental, social and economic performance to the next level? Are you impeded by silos, restricted budgets and never getting to the real issues that while uncomfortable, must be addressed? Do you wonder how you could engage your entire company and its stakeholders in a common purpose? You are not alone. The sustainability and responsibility function is increasingly integrated into corporate strategy, planning and execution. Leaders and teams are challenged to move beyond their technical expertise to become trusted change leaders, collaborating across the silos of their own organizations as well as with NGOs and governments. Each engagement will be customized to your needs that may evolve as we work together. Are you part of a leadership team or new to leadership? Have you caught yourself thinking, “What we really need is for the team to agree and employees to do what we hired them to do!” You’re not alone! Strategy development and tactical decisions typically require expertise, cooperation and input from up, down and across the organization. Leaders and staff can only operate on what is known at the time. Previously, the top officers provided “the solutions” that were carried out down the line. Now, instead of solutions, we must live with “best bets” and move forward. The “best bets” must be applied quickly and then adapted as needed. This approach requires a culture and staff that support risk-taking. Now too, for buy-in, staff need to understand what’s changing, why it is changing, when it will impact them, and who will ensure they are both supported and successful. Then, once launched, the feedback loop needs to be accurate and quick. Today, real success means no one can sit back and point fingers up, down nor sideways! All that may sound like hard work for a leader. Yet, tackling these new realities simply means putting into action updated tried and tested leadership skills that work in this new reality. Learning these new skills and knowing when and how to use them is not magic. It’s more about re-tooling your leadership. Does your team regularly turn to you for the answers? Do you find that you are again trying to solve what is essentially the same problem you thought was resolved? Do you wonder what it could be like to address the underlying issues that are both uncertain and uncomfortable to even think about? Whether you are on the board, in senior leadership or management, your situation is not uncommon. Individuals and groups are trained to plan and execute actions that predictably will show a good return. They turn to those in authority for clearly articulated plans and direction. Yet there are uncertainties and underlying issues that are seldom articulated or even understood. The best laid plans may go awry resulting in sub-optimal or even failed outcomes. Individuals at any level of the organization can lead, but many lack the self-knowledge and skills to effectively engage others in the work. Adaptive leadership provides a framework for diagnosing issues, engaging all relevant stakeholders and effectively addressing chronic and seemingly intractable problems. Joan provides her clients a combination of coaching and consulting. She is a certified executive coach and offers more than 30 years of successful experience in management, leadership, executive coaching and consulting in US and UK for corporate, government, education and non-profit organizations. Her particular areas of consulting expertise include leadership development, leading organizational and personal change, and effective teaming. The focus of my coaching is contributing to a client’s success. Executive coaching provides just-in-time support for challenges and pinpointed development for targeted professional goals. Executive coaching is a confidential process. Executive coaching has become a best practice in the field of executive and management development. Initially, I will work with the client to understand his/her background and coaching goals. Next, the client and the I hold a short call with the client’s supervisor. That call is to gather input from the client’s supervisor on the client’s existing strengths, key priorities, and any suggestions for coaching goals. Typically, my executive coaching is contracted for 20-30 hours, over a 6-9 month period. At the contract’s completion, clients often renew, adjusting the number of hours and/or contract duration. My coaching is typically conducted virtually rather than in person. This permits lower fees, as well as more focus, flexibility and privacy. My coaching calls are booked in advance and usually scheduled for one hour. The call schedule can be flexible. Just-in-time calls can be arranged, as may be necessary. It is important that the client feel comfortable with their coach and their coaching relationship. I encourage my prospective clients to consider their options and make the choice that best suits his or her needs. I encourage my clients to choose a coach with professional development expertise, business acumen and appropriate maturity. "Your coaching has been transformative for me. You are a treasure." "I will continue using the strategies and insights you have shared with me." "I learned and put into play new skills aligned with my objectives." "Joan quickly established trust and confidence." "She asked me questions that challenged my thinking and helped me explore alternative approaches and perspectives." "She helped me meet my objectives." "I increased my effectiveness at work." "The coaching increased my alignment with my manager." Alexander & Associates welcomes a no-fee initial discussion to hear about your current situation, challenges and expectations. We will work with you to design consultation, training and coaching assistance that will be effective given your needs and resources. We work on-site globally and also virtually, including video conferencing and collaboration tools. We work with individuals, teams and entire organizations. We specialize in “on-demand” assistance throughout our engagements and as needed for followup. We have practiced the principles of intentional leadership, forged meaningful connections and led sustainable change throughout our careers. 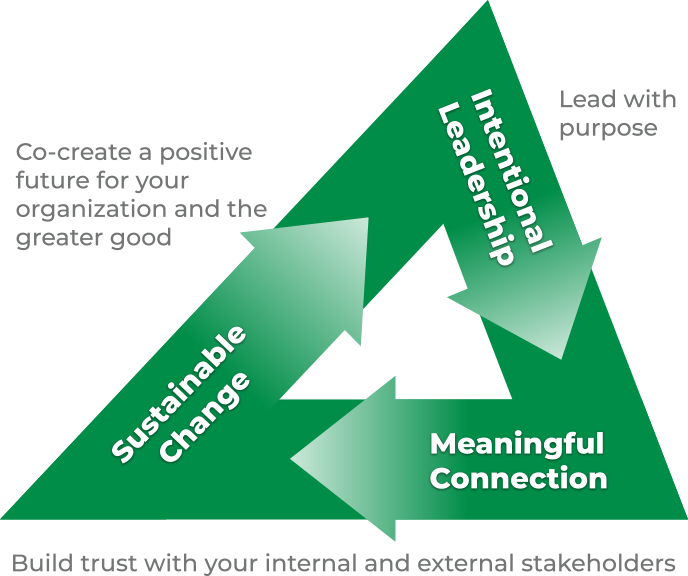 We have helped many others to lead with purpose, build trust with their internal and external stakeholders and co-create a future for their organizations and the greater good. Listed below are some of the results of our work in the private, non-profit, government and education sectors. Led a major global company to world class corporate responsibility. Bart designed and led the corporate responsibility strategy for Molson Coors by challenging and empowering senior leaders and the board to see the business benefits of a corporate-wide strategy. He had only one staffer, choosing instead to empower virtual teams across the company’s geographies and functions to develop and own the integration of sustainability into business strategy. Molson Coors was named the global beverage sector leader on the Dow Jones Sustainability Index, a leader in climate change action by the Carbon Disclosure Project, a Newsweek Green sustainable company and a Top 100 Corporate Citizen by CR Magazine. Put a major global IT consolidation and conversion project back on schedule and budget. By working with the client’s staff and the IT/system re-design consultants, Joan was able to quickly identify the people, project management and leadership blockages. She worked on-site in the UK to improve processes and communication. She also brought the client’s HR professionals in to begin conversations about staff retention and re-location plans. Produced higher profits and national collaboration for a US telecommunications company’s regional division. Joan’s approach combined executive coaching, consulting and work with the senior team. With the regional SVP, they identified strategies for more effective national collaboration. Under Joan’s guidance, the senior team created a stronger, more cooperative sense of team and together created a robust and aligned strategic business plan. Within six month, the SVP was promoted to a more senior and broader regional position. Mentored emerging leaders to become effective change makers. One of Bart’s mentees was named a GreenBiz 30 under 30 leader, and later led the staff work for the creation of the world’s largest certified B-corp. Guided responsible product development. Bart helped a major non-alcohol beverage company enter into the alcohol beverage market with an understanding of not only the legal and regulatory climate, but also the importance of alcohol responsibility concerns in product design and marketing. Promoted trustworthy organizations. Bart collaborated with colleagues through Trust Across America to develop twelve principles that underlie trustworthy businesses and other organizations — the Trust Alliance Principles, or TAP Into Trust. Bart has been named a Thought Leader in Trust by Trust Across America for several years in a row. Highlighted the ethical issues with emerging technologies to business audiences. Working with the Institute for Enterprise Ethics, Bart surveyed the ethical challenges of emerging artificial intelligence technologies and the challenges to government and business to handle unanticipated consequences. He explored the relevance of self-regulator models used in other industries in order to adapt to change that is likely beyond the capacities of governments to understand, let alone effectively regulate. Founded and served as CEO of a highly successful youth coaching non-profit. Joan conceived of and organized Touch Point Connection. She created the non-profit corporation, recruited Board, staff and volunteers, raised funds, and directly managed the entire operation. Joan forged the partnership with the school district and high school leadership, staff and counselors. Fifty trained community volunteers provided 1-to-1 coaching to more than 150 at-risk teens. School district data collected for 5 years demonstrated that coaching significantly improved the 3 key indicators of graduation success: grades, attendance and discipline referrals. Led the transition of an NGO from founder to new leadership. As Board Chairman of an organization assisting with the integration of refugees and other newcomers. Bart engaged all of the diverse stakeholders. Together, they sorted what needed to be retained as core and what must change to adapt to the turbulent environment around immigration. The new leader previously had extensive State Department experience in human rights as well as strong ties to the local community. Provided leadership development programs and fostered communities of collaboration for non-profit leaders. Joan designed and conducted several multi-month leadership development programs for non-profit executives, public education administrators and religious leaders. Outcomes included: more success and satisfaction, more successful time management strategies, and a better understanding of key leadership and change management competencies. Joan designed the programs to also create connection among the participants to encourage ongoing networking and mutual support. For a federal power authority, opened dialogue between regional and headquarters staff to co-operatively co-create processes to meet information and workflow deadlines. Joan encouraged her client, a senior staff manager at headquarters, to “go on the road for listening sessions” with each region. By active listening and asking more and deeper questions, headquarters staff better understood the challenges the regions faced and welcomed the suggestions for addressing them. All agreed to openly communicate about challenges, project timelines, and to work together for resolution. In several federal departments and agencies, successfully provided just-in-time guidance and strategies to leaders with expanded roles and new challenges. Joan’s executive coaching clients experience leadership challenges such as managing a growing division of hundreds of people, staff obstructing necessary change, influencing up, down and across the organization, leading virtual and cross-functional teams, and expectations to do more with less. Joan’s executive coaching and leadership consulting enabled leaders to employ leadership and change management frameworks immediately to keep their organizations moving forward quickly and effectively. Increased efficiency and effectiveness of federal, state and local government agencies through program reviews and new program development. Bart’s governmental career was marked by directing reviews of programs and processes, implementing technological, staffing and process improvement as well as leading new policy initiatives. For example, Bart led a team that reformed home care for vulnerable populations, an effort that included engaging community stakeholders, passing legislation, securing federal waivers, developing implementation procedures, promulgating regulations, direct training of field staff and implementation of data collection to measure outcomes. Results included reduced institutionalization, better care and reduced public expenditures. For a school principals and district department heads, created higher job satisfaction, reduced stress levels, increased leadership effectiveness and contributed to the formation of internal support networks. Joan provided a 9-month executive coaching, leadership development and organizational change series for a cohort of principals and another for the district’s department heads. In just one month, reduced discipline referrals by more than 60% in one public high school. An assistant principal, stressed by workdays totally consumed by discipline referrals, replaced “standard discipline conversations” with “coaching conversations.” Results were quick: with coaching, students discovered appropriate and effective strategies to handle conflict. Significantly improved academic success for at-risk and low-income students with “Success Coaching” programs in two public high schools. Joan first co-founded a coaching program with 30 community women who provided coaching to high school females in Edmonds, WA. Success was apparent, but no hard data was collected. Next, Joan founded and operated Touch Point Connection, a non-profit in Tucson, AZ. Fifty community volunteers served as “Success Coaches” to 120 at-risk high school students. The data, collected by the school district over the 5-year program duration, demonstrated that coaching positively and significantly impacted all 3 key indicators of graduation success.